BROOKHAVEN, Miss. (AP) — Residents mourning two officers killed in a weekend shootout in a small Mississippi city left roses, balloons and American flags at police headquarters Sunday and held an evening vigil in their memory. The candlelight vigil for Officer James White, 35, and Cpl. Zach Moak, 31, was held outside the Brookhaven Police Department where the officers had worked. There, every few minutes, people pulled up during the day in cars, leaving flowers, teddy bears and balloons not far from where their patrol cars were parked. Each car was adorned with an American flag and a wreath on its front grill. White and Moak were killed early Saturday. Warren Strain of the Mississippi Department of Public Safety said Sunday that the shooting suspect, 25-year-old Marquis Flowers, was hospitalized after being wounded in the confrontation. Strain said charges are pending against Flowers and that investigation is ongoing. He did not provide an update on Flowers’ medical condition. Strain had said earlier that the officers were called to a house in Brookhaven at about 5 a.m. Saturday for a report of shots fired. Following an exchange of gunfire that left both officers “mortally wounded,” the two were pronounced dead at a local hospital, Strain said. He identified the weapon used as a handgun but wouldn’t elaborate on the circumstances surrounding the shooting. On Sunday, children jumped on a trampoline not far from the shooting scene at a Brookhaven duplex. What appeared to be several bullet holes in the aged blue siding of the duplex were pointed out with evidence markers by investigators. What looked like blood stains could be seen on the ground steps away. Hanna Hux, a Brookhaven resident who has known White since she was 12, called the slain officer one of her “oldest, dearest friends.” She said she was stunned by his death. This is the second time in as many years that a law enforcement official has been killed in the line of duty in the Brookhaven area. 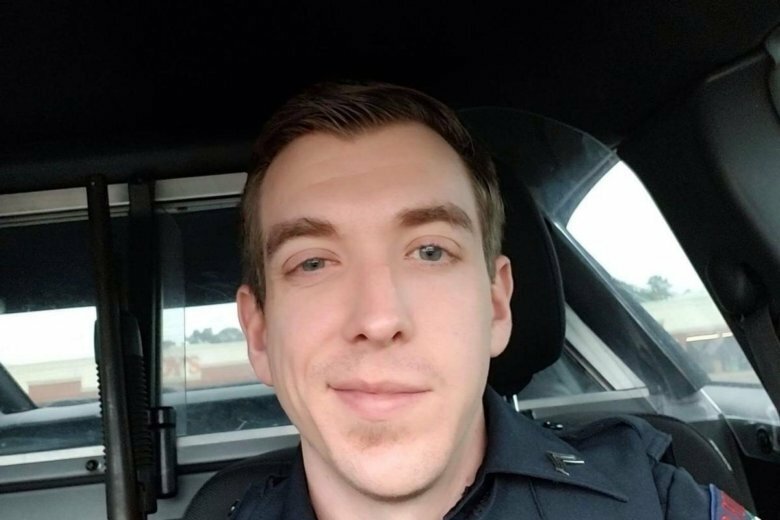 Last year Lincoln County Sheriff’s Deputy William Durr, who also spent four years with Brookhaven police, was responding to a call when he was shot to death. Authorities said the gunman shot and killed seven other people in a killing spree in and around the Brookhaven area. Willie Cory Godbolt was arrested May 28, 2017, and is awaiting trial. He is pleading not guilty and faces the death penalty if convicted.